This customer is a leading satellite TV distributor in UK. They need quite a lot of different satellite TV bracket to install the satellite antenna. Customer first by them from Italy, but later they found the cost is very high. Thus customer decide to buy them from China. 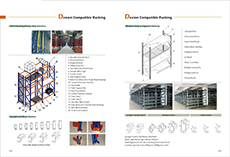 The customer got our information from Internet, and was impressed by our professional job in racking & shelving industry. Customer first send RFQ with detail specification to us. Our sales representative reply customer within a few hours. As the satellite is different from our standard bracket, our staff suggest customer make it with new mold and offer the total cost to customer. After compare with cost, customer found the price is very competitive, then customer would like to develop the bracket with us together. We reach an agreement that customer pay the mold cost first, then we make the product for customer, once the order quantity reach a certain amount, we will refund the mold cost to customer. Customer is happy with it and arrange mold cost immediately. Then the manufacturing department ask mold supplier tool the mold for us. After got the mold, we tool one set of sample and express to customer for approval. Customer is happy with the quality and place big order to us after got the sample. Now customer order full container every 2 months.